Since the introduction of endoscopic ultrasound (EUS)-guided fine-needle aspiration (FNA) in the early 1990s, the technique has emerged as a method of choice for tissue acquisition in the diagnosis of a broad spectrum of intraabdominal and intrathoracic malignancies. , Virtually any lesion or organ that lies in close proximity to the gastrointestinal (GI) tract can be accessed with a FNA needle. However, the utility of any tissue sampling method is measured not only by the ability to access a site and achieve an accurate diagnosis, but also by its safety profile. In this review, we discuss the adverse events that may be encountered when performing EUS-FNA of solid lesions and provide tips that may help avoid or minimize the risk of their occurrence. The subsequent discussion will focus on various adverse events with tips provided to help avoid each specific event. However, there are general measures that may be taken to reduce the risk of all adverse events and should be considered prior to EUS. Endosonographers must be mindful of the indications and impact of performing FNA on clinical care. There must be the potential for the findings from both the EUS and FNA to impact patient management. Certainly, other factors such as the clinical need to obtain a tissue diagnosis must be carefully weighed against the risk of the procedure, including the presence and severity of comorbidities. These factors impact decisions regarding the need and timing of EUS-FNA. The lack of a sound justification for EUS, likely indicates an unnecessary FNA as well. Periprocedural planning is also key to optimize exam safety. Much can often be learned from thoroughly reviewing the clinical records, imaging studies and in particular prior EUS exams. As a part of pre-procedural planning, ensuring adequate sedation, through either monitored anesthesia care or general anesthesia, helps avoid inadvertent or uncontrolled patient movement that may increase the risk of complications. It is also important to consider the lesion to be sampled. For instance, the clinical consequence of an adverse event secondary to sampling a perigastric lymph node likely differs from those that occur when sampling a pancreatic or mediastinal mass. Finally, knowing when to ask for help can save both you and the patient an undesired outcome. Knowing one's own experience and expertise is important as is relying on other endoscopists, interventional radiologists, or surgeons within a given institution or referral center when assistance is needed. 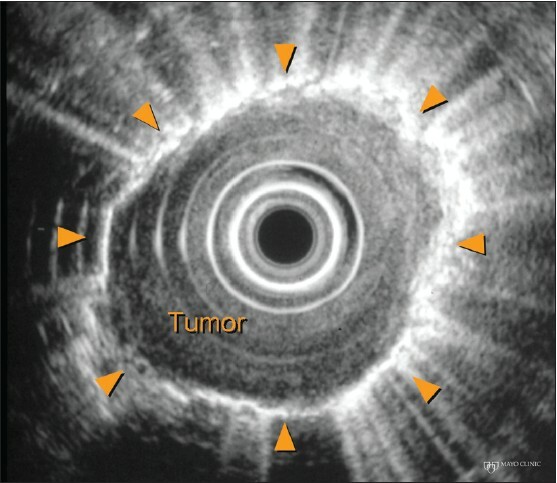 Luminal perforation during EUS most often results from the echoendoscope itself. Compared with the standard upper endoscope, the echoendoscope is several millimeters wider (9-9.8 mm vs. 12.4-14.6 mm, respectively). In general, echoendoscopes have a longer non-flexible region between the tip of the scope and the bending region. In addition, the degree of angulation that can be achieved within the distal segment of echoendoscopes is less than that of standard endoscopes. These properties, along with the side-viewing nature of echoendoscopes makes intubation and scope advancement around regions of angulation more difficult and increase the risk of perforation. The risk of perforation likely varies based on the particular echoendoscope. For instance, echoendoscopes with longer and less angulated transducers are often larger in caliber and have a longer non-flexible distal region which is necessary to house the increased number of cable components. Although such instruments may offer enhanced imaging, they also can also negatively impact the physical properties of the echoendoscope. Cervical esophageal perforation was reported in 16 of 43,852 upper GI EUS examinations (0.03%) performed by 86 members of the American Endosonography Club who participated in a survey. One patient died due to the perforation (0.002% mortality), two patients required surgical intervention, while the remaining 13 patients were treated conservatively with or without percutaneous drainage. The majority (94%) of patients were elderly (age ≥ 65 years) and 94% of the cases occurred using the radial echoendoscope. 9 (56%) perforations occurred in the hands of an endosonographer who had less than 1 year of experience, suggesting that inexperience may increase the risk of perforation. A significant proportion (44%) of patients had a history of difficult intubation during prior endoscopies or had large cervical osteophytes (19%) that were thought to contribute to the perforation. Other perceived contributing factors included frail patients, inadvertent patient movement during intubation and forceful blind intubation. A prospective study of 4894 upper GI EUS examinations performed by one experienced endosonographer documented 3 (0.06%) cervical esophageal perforations, all which occurred using a linear echoendoscope. All three perforations were recognized at the time of intubation and the most common finding was a yellow area in the posterior hypopharynx, reflecting the echoendoscope entering the mediastinum. The patients all underwent surgical repair with complete recovery without subsequent swallowing difficulty. In contrast to the prior study, the perforations did not occur early in the endosonographers experience, but after the first 2500 procedures. In addition, cervical osteophytes were not felt to be a contributing factor. However, the patients were retrospectively noticed to have a short and webbed-appearing neck that was thought to contribute to the perforation. Luminal obstruction secondary to a malignant or benign esophageal stricture was historically viewed as a risk factor for perforation. Malignant tumor obstruction may prohibit passage of the echoendoscope and limit T and N staging in approximately 30% of patients. In a prospective study of 3324 patients who underwent EUS at a single center, five patients developed an esophageal perforation (0.15%), which accounted for half of all adverse events. Two patients had prior dilation using a 15 mm through-the-scope balloon immediately preceding the EUS examination. One patient who did not undergo prior dilation required surgical intervention, three recovered after stenting and conservative treatment and one patient did not require any endoscopic or surgical therapy. Duodenal perforation is more common than esophageal perforation and in one retrospective study was reported in 0.022% (19 of 85,084 upper EUS examinations) when compared to 0.009% of esophageal perforations (N = 8). , Factors felt to have contributed to duodenal perforation included duodenal diverticula (N = 4), stenosis (N = 3), ulceration (N = 1), scarring (N = 1) and acute pancreatitis (N = 1). In another study, 2 of 233 patients (0.86%) who underwent EUS-FNA for presumed pancreatic cancer experienced a duodenal perforation that required surgical intervention. Death has also been reported followed duodenal perforation. A study by Carrara et al. describe one death attributed to duodenal perforation in a patient with duodenal infiltration of a neuroendocrine tumor. 7 of 8 deaths recorded in a multicenter Israeli study of 20,000 EUS were attributed to duodenal perforations using a linear echoendoscope. 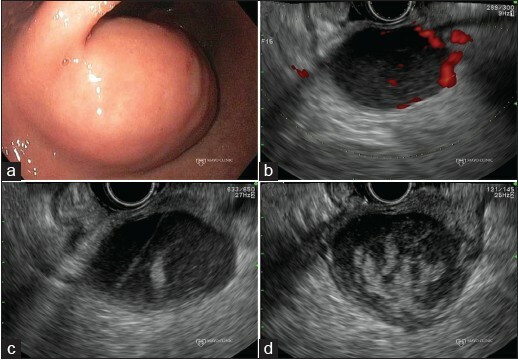 In this study, duodenal diverticula were thought to contribute to 4 (57.1%) of the complications and endosonographer inexperience (defined as <300 total procedures) was implicated in five cases (71.4%). No study has been reported to date evaluating the risk of colorectal perforation during lower GI EUS. It is important to have an understanding of any anatomic features that may predispose to perforation including a Zenker's diverticulum, hiatal hernia, duodenal diverticulum, malignant or benign stenosis, or surgically altered anatomy. For instance, knowledge of a large duodenal diverticulum may lead to caution when retracting the echoendoscope within the duodenum, because this maneuver typically leads to some scope advancement that may be potentially problematic. Knowledge regarding any prior difficult exams is also helpful in planning future exams. Initial intubation and scope advancement, particular around angulated regions, are also facilitated by scope lubrication and use of a partially inflated balloon. In our practice, we also limit dilation to 15 mm, which nearly uniformly allows echoendoscope passage and limits the risk of perforation. One must also question the need to traverse some malignant strictures given that the vast majority of truly obstructing esophageal cancers is an advanced stage without the potential for EUS findings to impact patient care. Only one study has examined the risk of bacteremia following lower GI EUS in 100 patients. Blood cultures were taken immediately prior to any procedure, after the flexible sigmoidoscopy or radial echoendoscope exam and 15 min after EUS-FNA. Contaminants were found in four patients, whereas two patients had bacteremia with Bacteroides fragilis or Gemella morbillorum. In the patient with the Bacteroides bacteremia, only the 2 nd set of blood cultures taken after the flexible sigmoidoscopy and/or radial EUS exam was positive, while in the patient with Gemella bacteremia the final blood culture returned positive. An updated prospective evaluation of 563 patients who underwent lower GI EUS-FNA at our center will show that five patients developed low-grade fever without clinical significance. Of note, there was no patient overlap between our two lower GI EUS-FNA studies. Most infectious adverse events are associated with EUS-FNA of cystic lesions, rather than solid masses or lymph nodes. When excluding cystic pancreatic lesions, a meta-analysis evaluating adverse events associated with EUS-FNA reported infectious adverse events in only 3 of 10,032 EUS-FNA (0.03%) exams. The same meta-analysis identified two patients who developed infectious adverse events among 909 EUS-FNA exams (0.22%) of cystic pancreatic lesions. EUS trucut biopsy (TCB) of submucosal tumors (SMT) has also been associated with infectious adverse events. Two infectious adverse events (3.9%) occurred in 49 patients undergoing EUS TCB of a gastric SMT. One patient with a hepatocellular carcinoma invading the gastric wall developed streptococcal sepsis requiring a 7 day hospitalization, complicated by Clostridium difficile colitis. The other patient developed an abscess around a large gastrointestinal stromal tumor (GIST) that required surgical drainage. A 49-year-old patient who underwent 7 EUS-FNA passes using a 22-gauge needle of a duodenal mass was given prophylactic antibiotics for a suspected infectious granulomatous infection based on FNA results. 6 weeks after completing the course of antibiotics, the patient developed fever and epigastric pain. Abdominal CT scan revealed a large periduodenal mass containing air-fluid levels and the abscess resolved with IV antibiotics and endoscopic drainage. EUS-FNA was repeated 2 weeks later allowing diagnosis of a duodenal GIST for which the patient underwent pancreaticoduodenectomy. No infectious adverse events occurred in our prior prospective study on EUS-FNA of rectal and perirectal lesions (N = 100) or within our most recent prospective study (N = 563). Two of 69 patients who underwent EUS-FNA of extramural pelvic masses developed an abscess. Both these patients had cystic pelvic lesions, one received prophylactic antibiotic and both required percutaneous drainage. In patients with solid pelvic masses in this series, no abscesses or other infectious adverse events were diagnosed. Current guidelines do not recommend using prophylactic antibiotics in average risk patients undergoing EUS-FNA of solid masses or lymph nodes as the risk of infectious adverse events is not higher than other routine endoscopies. One must consider the relative risk versus perceived need for antibiotics when sampling lesions that are partly cystic. Although there are insufficient data to verify the need we often administer antibiotics whenever the FNA needle traverses the bile duct, pancreatic duct, or major vascular structure. In addition, while data refute the need for antibiotics for lower GI EUS-FNA, the studies were conducted in centers that routinely administer a full colon prep. It is unclear whether antibiotics are necessary among patients whose colon prep is deemed inadequate. Five patients (0.44%) had intraluminal bleeding following EUS-FNA of 1135 SMT in a multicenter study. One patient had severe bleeding following FNA of a duodenal GIST which required packed red blood cell transfusions. The other four patients required endoscopic therapy of the bleeding site. Three patients had EUS-FNA performed while on antithrombotic agents, none of whom experienced bleeding adverse events. Extraluminal bleeding [Figure 2] was found in 3 of 227 patients (1.3%) with normal coagulation studies who underwent EUS-FNA at a single institution. Despite the use of Doppler to identify intervening vascular structures, extraluminal bleeding occurred during FNA of a pancreatic tail mass, periesophageal lymph node in a patient with esophageal cancer and cystic pancreatic lesion. In every case the extraluminal bleeding appeared as a hypoechoic region in proximity to the FNA. Their practice was to apply tamponade for 15-20 min using the echoendoscope balloon and tip deflection. They noted that the hypoechoic region stabilized in size within that time and no clinical sequela (i.e., decreasing hematocrit or symptom development) occurred in any patient. One patient in the Gress et al. study described above experienced a peripancreatic bleed, which eventually lead to death. After two FNA passes were obtained, significant bleeding developed in the vicinity of the FNA. Epinephrine was injected and the procedure was aborted before adequate samples could be obtained. Approximately 12 h later, the patient became hypotensive with a 3 g/dL drop in hemoglobin. Esophagogastroduodenoscopy (EGD) failed to identify the bleeding source. A bleeding scan and later an angiogram localized the bleed to an inferior pancreaticoduodenal artery pseudoaneurysm, which was embolized. The patient developed respiratory failure and died 3 days later. There was a question of whether the patient may have formed the pseudoaneurysm secondary to the pancreatic cancer itself or whether there was sufficient time to develop as direct consequence of the FNA. The technique of EUS-FNA may impact the risk of bleeding. It is thought by some that larger blood vessels lie within the center of a solid mass. If true, then one may diminish the risk of bleeding by initially targeting the periphery of the mass and only move centrally if inadequate samples are obtained. Doppler imaging may clarify the need within individual lesions. In addition, since extraluminal bleeding likely occurs from traversing blood vessels that run along the surface of the lesion, some suggest to limit the number of needle punctures made to the surface of the solid lesion to decrease the risk of bleeding adverse events. One must also be sure that smaller and/or easily compressible blood vessels (e.g., varices) are not within the needle path. Such vessels are easily compressed by the echoendoscope and flow may even be obscured during Doppler imaging. Furthermore, when we unintentionally, or intentionally, traverse a blood vessel during EUS-FNA, care is taken to avoid torquing the echoendoscope as this may lacerate the blood vessel wall and increase the risk of bleeding. Gress et al. in their study reported two cases of acute pancreatitis developing in a cohort of 100 patients. Both patients each had two prior episodes of pancreatitis and were undergoing EUS-FNA of a mass in either the head or body of the pancreas. Their last episode of pancreatitis occurred at 6 and 8 weeks prior to the EUS. In this study, three additional patients had elevated pancreatic enzymes without clinical symptoms of pancreatitis 2 h after the procedure. As is true following endoscopic retrograde cholangiopancreatogram (ERCP), there is no clinical utility for checking serum pancreatic enzyme levels in asymptomatic patients following EUS-FNA. In a multicenter United States survey, pancreatitis occurred in 14 of 4909 (0.29%) EUS-FNA of solid pancreatic masses. The targeted lesion was located in the head for majority of the cases (N = 12), whereas the lesion was located in the body and tail in one patient each. Half of the patients had benign FNA cytopathology results, despite the overall smaller cohort of patients with benign pancreatic disease, suggesting that the risk of pancreatitis is higher in these patients who are undergoing the EUS for benign reasons such as recurrent acute pancreatitis. One patient with multiple other comorbidities died from a pulmonary embolism. In a systematic review and meta-analysis of EUS adverse events, acute pancreatitis occurred in 36 of 8246 patients (0.44%) undergoing EUS-FNA of pancreatic solid or cystic lesions. Of these, 27 were mild (hospitalized for 2-3 days), 6 moderate (hospitalized for 4-10 days) and 3 were severe (hospital stay >10 days, presence of necrosis, abscess, or pseudocyst, or required percutaneous drainage or surgery). One patient with severe pancreatitis died. Although rare, there are three case reports describing a pancreatic duck leak following EUS-FNA. ,, A 71-year-old woman underwent EUS-FNA of a pancreatic tail cyst, which was complicated by a loculated pancreatic fluid collected with an amylase content of 7809 U/L that required percutaneous drainage. The patient underwent pancreatic duct stenting via ERCP and the fluid collection resolved. She was found to have a tubulovillous adenoma with high-grade dysplasia involving the ampulla, which was thought to contribute to the pancreatic duct leak. The second case was of a 67-year-old woman with metastatic carcinoid who underwent EUS-FNA with a 25-gauge needle of a pancreatic neck mass which was complicated by pancreatic ascites. Diagnostic and therapeutic paracentesis revealed pancreatic fluid with an amylase of 2480 U/L. The patient underwent ERCP with pancreatic duct stenting and the ascites resolved within several months. The final case described a 60-year-old man who underwent three passes using a 22-gauge needle of a pancreatic body pancreatic neuroendocrine tumor (PNET) that was found to be compressing the main pancreatic duct. At 2 weeks later the patient presented with worsening abdominal pain and was found to have an 11.5 cm × 9.5 cm pseudocyst that communicated with the main pancreatic duct. EUS-guided cystgastrostomy and ERCP with pancreatic duct stenting was performed, followed by distal pancreatectomy for the PNET. Although not proven, the risk of developing acute pancreatitis with EUS-FNA may be decreased by waiting 8 weeks after clinical resolution of the prior episode of acute pancreatitis. In addition, the indication for pancreatic EUS-FNA should be taken into consideration as there is evidence to suggest the increased risk of pancreatitis in patients with non-malignant pancreatic pathology. Although the analysis was not limited to pancreatitis (pancreatitis N = 6, abdominal pain N = 4, bleeding N = 1), a multivariate analysis concerning the risk factors associated with adverse events following EUS-FNA of solid pancreatic masses was significant for tumor size ≤20 mm (odds ratio [OR] 18.48, 95% CI: 3.55-96.17) and PNET (OR: 36.5, 95% CI: 1.73-771.83). Therefore, EUS-FNA of small pancreatic lesions suspected to be PNETs should also be approached with caution. We also recommend selecting a needle path and trajectory that allows traversal of as little healthy pancreatic parenchyma as possible and we believe this may account for the different rates of pancreatitis when sampling benign versus malignant pancreatic lesions. Care should also be taken to avoid not only the main pancreatic duct, but also larger side branches, in particular those located upstream from a mass resulting in a dilated duct that contains pancreatic fluid under high pressure that may extravasate from the needle track. Biliary adverse events following EUS-FNA may occur if the bile duct is inadvertently punctured. Bile peritonitis occurred in a 54-year-old man with a 2 cm pancreatic head lesion causing obstructive jaundice who underwent EUS-FNA with a 22-gauge needle. 2 days after EUS, the patient developed ascites, a fever and physical exam evidence of peritonitis. Endoscopic and percutaneous attempts to drain the bile duct were unsuccessful, which lead to laparotomy during which bilious ascitic fluid was found along with a 1 mm perforation of the bile duct. He underwent surgical drainage with resolution of his jaundice, but was subsequently found to have metastatic pancreatic cancer. To avoid adverse events related to the biliary system, one should ensure that the FNA needle does not transect the bile duct. In particular, the endosonographer should be cautious in performing FNA around an obstructed bile duct as the only biliary adverse events reported in the literature were in patients with an inadequately drained biliary system. It is sometimes difficult to identify the bile duct as it courses through a pancreatic mass given the resulting narrowing that results. The enhanced diagnostic capability of EUS-FNA must be balanced against the risk of tumor seeding; also sometimes referred to as needle tract seeding or implantation metastasis. Until date, tumor seeding has been reported in six patients following EUS-FNA. ,,,,, FNA of four pancreatic adenocarcinomas of the pancreatic body or tail resulted in posterior gastric body metastases at a median of 23 (range: 21-36) months after partial pancreatectomy. ,,, Tumor seeding following EUS-FNA of a pancreatic head mass has not been reported, as the area that the needle traverses the duodenum is resected during pancreaticoduodenectomy and therefore seeding is likely not discernible. Shah et al. in their study reported a patient who developed of gastric wall metastases following EUS-FNA of metastatic melanoma to the perigastric lymph nodes 6 months prior. The remaining patient underwent EUS-FNA of a malignant mediastinal lymph node secondary to metastatic gastric cancer. The patient's lymph node responded well to chemotherapy therefore he eventually underwent a partial gastrectomy. At 18 months after surgery the patient developed mid-esophageal metastases located in the region of prior EUS-FNA. In all these six patients, except the first, a 22-gauge needle was used to perform a median of 2 (range: 1-5) passes. The potential for tumor cell displacement during FNA was recently demonstrated. In a prospective study of 140 patients undergoing EUS, the luminal fluid that is routinely aspirated through the accessory channel was submitted for cytological analysis. Luminal fluid cytology was positive for malignancy in 48% of patients with a luminal cancer, which may be expected given the inherent tumor shedding that occurs within the GI lumen. More concerning was the detection of positive cytology within post-FNA luminal fluid in 3 of 26 patients (11.5%) with pancreatic cancer. In patients with extraluminal cancers such as pancreatic cancer, we would not anticipate finding malignant cells within the GI luminal fluid. This finding suggests the process of FNA may withdraw malignant cells from a pancreatic cancer into the gut. This is likely an analogous method by which needle tract seeding occurs. The risk of tumor seeding may be reduced by performing FNA only when the results may impact patient management. This is particularly important for lesions located in areas where the needle tract is not situated within the surgical resection margins. For instance, in some centers, because of the potential for tumor seeding and associated worse outcomes, patients with CCA are denied transplantation if they have undergone FNA of their primary tumor. Furthermore, the endoscopist should ensure that the targeted lesion is located as close to the echoendoscope transducer as safely possible to limit the amount of tissue traverse by the needle during FNA. A case of pneumoperitoneum without overt perforation was described in a 60-year-old female with a pancreatic head mass that underwent three FNA passes from the duodenum using a 22-gauge needle. 6 days later, the patient on staging CT scan was found to have massive pneumoperitoneum. The patient was asymptomatic, treated conservatively with antibiotics with resolution of the pneumoperitoneum within 2.5 weeks. The authors proposed that the air used for insufflation entered the peritoneum through a pre-existing mucosal disruption or the high intraluminal pressure allowed air to dissect through perivascular or perineural sheaths. Although not reported in the literature, we experienced a case of pneumothorax following EUS-FNA performed for esophageal cancer staging [Figure 4]. Stigt et al. reported a case of a 54-year-old female with metastatic lung cancer treated with chemotherapy who underwent EUS-FNA of a paraesophageal lymph node metastasis. She received bevacizumab 13 and 8 days prior to EUS. A chest scan performed at 4 and 8 weeks revealed a progressively enlarging air space in the region of the paraesophageal lymph node. EGD showed two elongated fissures with overlying blood clots. During aspiration, air bubbles could be seen arising from the fissures. The patient was treated with tube feeds and antibiotics. The authors recommend against performing EUS-FNA in patients who are taking bevacizumab, which may have delayed the wound healing process. Another case of a mediastinal-esophageal fistula occurred in a patient who had weight loss and mediastinal lymphadenopathy. EUS-FNA of a subcarinal lymph node was performed with four passes using a 22-gauge needle. Cultures from the FNA aspirate diagnosed the patient with tuberculosis. To evaluate new onset dysphagia, the patient underwent a thoracic CT scan that showed multiple esophageal submucosal air collections. He was started on tuberculosis medications with complete resolution of the fistula. FNA is a generally safe and effective modality for tissue acquisition in the diagnosis of GI and non-GI pathology. However, adverse events do develop and having a thorough understanding of the breadth and rates of adverse events facilitates patient counseling. Steps may be taken to minimize the risk, but when they occur early recognition is vital to allow timely intervention and improved outcomes. 2. Wiersema MJ, Hawes RH, Tao LC, et al. Endoscopic ultrasonography as an adjunct to fine needle aspiration cytology of the upper and lower gastrointestinal tract. Gastrointest Endosc 1992:38;35-9. 3. Jenssen C, Alvarez-Sánchez MV, Napoléon B, et al. Diagnostic endoscopic ultrasonography: Assessment of safety and prevention of complications. World J Gastroenterol 2012:18;4659-76. 4. ASGE Standards of Practice Committee, Early DS, Acosta RD, et al. Adverse events associated with EUS and EUS with FNA. Gastrointest Endosc 2013:77;839-43. 5. Das A, Sivak MV Jr, Chak A. Cervical esophageal perforation during EUS: A national survey. Gastrointest Endosc 2001:53;599-602. 6. Eloubeidi MA, Tamhane A, Lopes TL, et al. Cervical esophageal perforations at the time of endoscopic ultrasound: A prospective evaluation of frequency, outcomes, and patient management. Am J Gastroenterol 2009:104;53-6. 7. Pfau PR, Ginsberg GG, Lew RJ, et al. Esophageal dilation for endosonographic evaluation of malignant esophageal strictures is safe and effective. Am J Gastroenterol 2000:95;2813-5. 8. Mortensen MB, Fristrup C, Holm FS, et al. Prospective evaluation of patient tolerability, satisfaction with patient information, and complications in endoscopic ultrasonography. Endoscopy 2005:37; 146-53. 9. Kallimanis GE, Gupta PK, al-Kawas FH, et al. Endoscopic ultrasound for staging esophageal cancer, with or without dilation, is clinically important and safe. Gastrointest Endosc 1995:41;540-6. 10. Wallace MB, Hawes RH, Sahai AV, et al. Dilation of malignant esophageal stenosis to allow EUS guided fine-needle aspiration: Safety and effect on patient management. Gastrointest Endosc 2000:51;309-13. 11. Jenssen C, Faiss S, Nürnberg D. Complications of endoscopic ultrasound and endoscopic ultrasound-guided interventions - results of a survey among German centers. Z Gastroenterol 2008:46;1177-84. 12. Raut CP, Grau AM, Staerkel GA, et al. Diagnostic accuracy of endoscopic ultrasound-guided fine-needle aspiration in patients with presumed pancreatic cancer. J Gastrointest Surg 2003:7;118-26. 13. Carrara S, Arcidiacono PG, Mezzi G, et al. Pancreatic endoscopic ultrasound-guided fine needle aspiration: Complication rate and clinical course in a single centre. Dig Liver Dis 2010:42;520-3. 14. Lachter J. Fatal complications of endoscopic ultrasonography: A look at 18 cases. Endoscopy 2007:39;747-50. 15. Sahai AV. Balloon-assisted esophageal intubation to prevent cervical perforation during EUS. Gastrointest Endosc 2002:55;140-1. 16. Barawi M, Gottlieb K, Cunha B, et al. A prospective evaluation of the incidence of bacteremia associated with EUS-guided fine-needle aspiration. Gastrointest Endosc 2001:53;189-92. 17. Levy MJ, Norton ID, Wiersema MJ, et al. Prospective risk assessment of bacteremia and other infectious complications in patients undergoing EUS-guided FNA. Gastrointest Endosc 2003:57;672-8. 18. Janssen J, König K, Knop-Hammad V, et al. Frequency of bacteremia after linear EUS of the upper GI tract with and without FNA. Gastrointest Endosc 2004:59;339-44. 19. Levy MJ, Norton ID, Clain JE, et al. Prospective study of bacteremia and complications With EUS FNA of rectal and perirectal lesions. Clin Gastroenterol Hepatol 2007:5;684-9. 20. Chang KJ, Nguyen P, Erickson RA, et al. The clinical utility of endoscopic ultrasound-guided fine-needle aspiration in the diagnosis and staging of pancreatic carcinoma. Gastrointest Endosc 1997:45; 387-93. 21. Eloubeidi MA, Tamhane A, Varadarajulu S, et al. Frequency of major complications after EUS-guided FNA of solid pancreatic masses: A prospective evaluation. Gastrointest Endosc 2006:63;622-9. 22. Wang KX, Ben QW, Jin ZD, et al. Assessment of morbidity and mortality associated with EUS-guided FNA: A systematic review. Gastrointest Endosc 2011:73;283-90. 23. Pai KR, Page RD. Mediastinitis after EUS-guided FNA biopsy of a posterior mediastinal metastatic teratoma. Gastrointest Endosc 2005:62;980-1. 24. Will U, Meyer F, Bosseckert H. Successful endoscopic management of iatrogenic mediastinal infection and subsequent esophagomediastinal fistula, following endosonographically guided fine-needle aspiration biopsy. Endoscopy 2005:37;88-90. 25. Aerts JG, Kloover J, Los J, et al. EUS-FNA of enlarged necrotic lymph nodes may cause infectious mediastinitis. J Thorac Oncol 2008:3;1191-3. 26. Savides TJ, Margolis D, Richman KM, et al. Gemella morbillorum mediastinitis and osteomyelitis following transesophageal endoscopic ultrasound-guided fine-needle aspiration of a posterior mediastinal lymph node. Endoscopy 2007:39 Suppl 1;E123-4. 27. van Fraeyenhove F, Lamot C, Vogelaers D, et al. A rare infectious complication after endoscopic ultrasound guided fine needle aspiration in an oncological patient and review of the literature. Acta Clin Belg 2009:64;147-9. 28. Polkowski M, Gerke W, Jarosz D, et al. Diagnostic yield and safety of endoscopic ultrasound-guided trucut [corrected] biopsy in patients with gastric submucosal tumors: A prospective study. Endoscopy 2009:41;329-34. 29. DeWitt J, Al-Haddad M, Fogel E, et al. Endoscopic transduodenal drainage of an abscess arising after EUS-FNA of a duodenal GI stromal tumor. Gastrointest Endosc 2009:70;185-8. 30. Mohamadnejad M, Al-Haddad MA, Sherman S, et al. Utility of EUS-guided biopsy of extramural pelvic masses. Gastrointest Endosc 2012:75;146-51. 31. Hirota WK, Petersen K, Baron TH, et al. Guidelines for antibiotic prophylaxis for GI endoscopy. Gastrointest Endosc 2003:58;475-82. 32. Gress FG, Hawes RH, Savides TJ, et al. Endoscopic ultrasound-guided fine-needle aspiration biopsy using linear array and radial scanning endosonography. Gastrointest Endosc 1997:45;243-50. 33. Voss M, Hammel P, Molas G, et al. Value of endoscopic ultrasound guided fine needle aspiration biopsy in the diagnosis of solid pancreatic masses. Gut 2000:46;244-9. 34. Eloubeidi MA, Chen VK, Eltoum IA, et al. Endoscopic ultrasound-guided fine needle aspiration biopsy of patients with suspected pancreatic cancer: Diagnostic accuracy and acute and 30-day complications. Am J Gastroenterol 2003:98;2663-8. 35. Hamada T, Yasunaga H, Nakai Y, et al. Rarity of severe bleeding and perforation in endoscopic ultrasound-guided fine needle aspiration for submucosal tumors. Dig Dis Sci 2013:58;2634-8. 36. Affi A, Vazquez-Sequeiros E, Norton ID, et al. Acute extraluminal hemorrhage associated with EUS-guided fine needle aspiration: Frequency and clinical significance. Gastrointest Endosc 2001:53;221-5. 37. Kien-Fong Vu C, Chang F, Doig L, et al. A prospective control study of the safety and cellular yield of EUS-guided FNA or Trucut biopsy in patients taking aspirin, nonsteroidal anti-inflammatory drugs, or prophylactic low molecular weight heparin. Gastrointest Endosc 2006:63;808-13. 38. Veitch AM, Baglin TP, Gershlick AH, et al. Guidelines for the management of anticoagulant and antiplatelet therapy in patients undergoing endoscopic procedures. Gut 2008:57;1322-9. 39. Boustière C, Veitch A, Vanbiervliet G, et al. Endoscopy and antiplatelet agents. European Society of Gastrointestinal Endoscopy (ESGE) Guideline. Endoscopy 2011:43;445-61. 40. Polkowski M, Larghi A, Weynand B, et al. Learning, techniques, and complications of endoscopic ultrasound (EUS)-guided sampling in gastroenterology: European Society of Gastrointestinal Endoscopy (ESGE) Technical Guideline. Endoscopy 2012:44;190-206. 41. Gress F, Michael H, Gelrud D, et al. EUS-guided fine-needle aspiration of the pancreas: Evaluation of pancreatitis as a complication. Gastrointest Endosc 2002:56;864-7. 42. Eloubeidi MA, Gress FG, Savides TJ, et al. Acute pancreatitis after EUS-guided FNA of solid pancreatic masses: A pooled analysis from EUS centers in the United States. Gastrointest Endosc 2004:60;385-9. 43. Katanuma A, Maguchi H, Yane K, et al. Factors predictive of adverse events associated with endoscopic ultrasound-guided fine needle aspiration of pancreatic solid lesions. Dig Dis Sci 2013:58;2093-9. 44. Mueller PR, Miketic LM, Simeone JF, et al. Severe acute pancreatitis after percutaneous biopsy of the pancreas. AJR Am J Roentgenol 1988:151;493-4. 45. Babich JP, Bonasera RJ, Klein J, et al. Pancreatic ascites: Complication after endoscopic ultrasound-guided fine needle aspiration of a pancreatic cyst. Endoscopy 2009:41 Suppl 2;E211-2. 46. Reddymasu S, Oropeza-Vail MM, Williamson S, et al. Pancreatic leak after endoscopic ultrasound guided fine needle aspiration managed by transpapillary pancreatic duct stenting. JOP 2011:12;489-90. 47. Chung KH, Ryu JK, Oh HS, et al. Pancreatic pseudocyst after endoscopic ultrasound-guided fine needle aspiration of pancreatic mass. Clin Endosc 2012:45;431-4. 48. Chen HY, Lee CH, Hsieh CH. Bile peritonitis after EUS-guided fine-needle aspiration. Gastrointest Endosc 2002:56;594-6. 49. tenBerge J, Hoffman BJ, Hawes RH, et al. EUS-guided fine needle aspiration of the liver: Indications, yield, and safety based on an international survey of 167 cases. Gastrointest Endosc 2002:55;859-62. 50. Paquin SC, Gariépy G, Lepanto L, et al. A first report of tumor seeding because of EUS-guided FNA of a pancreatic adenocarcinoma. Gastrointest Endosc 2005:61;610-1. 51. Shah JN, Fraker D, Guerry D, et al. Melanoma seeding of an EUS-guided fine needle track. Gastrointest Endosc 2004:59;923-4. 52. Doi S, Yasuda I, Iwashita T, et al. Needle tract implantation on the esophageal wall after EUS-guided FNA of metastatic mediastinal lymphadenopathy. Gastrointest Endosc 2008:67;988-90. 53. Ito Y, Asahi S, Matsuzuka F, et al. Needle tract implantation of follicular neoplasm after fine-needle aspiration biopsy: Report of a case. Thyroid 2006:16;1059-62. 54. Suzuki K, Takamochi K, Funai K, et al. Needle tract implantation clearly visualized by computed tomography following needle biopsy of malignant mesothelioma. Eur J Cardiothorac Surg 2006:29;1051. 55. Fowler N, Asatiani E, Cheson B. Needle tract seeding after bone marrow biopsy in non-Hodgkin lymphoma. Leuk Lymphoma 2008:49;156-8. 56. Chang S, Kim SH, Lim HK, et al. Needle tract implantation after percutaneous interventional procedures in hepatocellular carcinomas: Lessons learned from a 10-year experience. Korean J Radiol 2008:9;268-74. 57. Rowe LR, Mulvihill SJ, Emerson L, et al. Subcutaneous tumor seeding following needle core biopsy of hepatocellular carcinoma. Diagn Cytopathol 2007:35;717-21. 58. Liu YW, Chen CL, Chen YS, et al. Needle tract implantation of hepatocellular carcinoma after fine needle biopsy. Dig Dis Sci 2007:52;228-31. 59. Sakata J, Shirai Y, Wakai T, et al. Catheter tract implantation metastases associated with percutaneous biliary drainage for extrahepatic cholangiocarcinoma. World J Gastroenterol 2005:11;7024-7. 60. Gerhards MF, Gonzalez DG, ten Hoopen-Neumann H, et al. Prevention of implantation metastases after resection of proximal bile duct tumours with pre-operative low dose radiation therapy. Eur J Surg Oncol 2000:26;480-5. 61. Lundstedt C, Stridbeck H, Andersson R, et al. Tumor seeding occurring after fine-needle biopsy of abdominal malignancies. Acta Radiol 1991:32;518-20. 62. Smith EH. Complications of percutaneous abdominal fine-needle biopsy. Review. Radiology 1991:178;253-8. 63. Castells A, Boix L, Bessa X, et al. Detection of colonic cells in peripheral blood of colorectal cancer patients by means of reverse transcriptase and polymerase chain reaction. Br J Cancer 1998:78;1368-72. 64. Wyld DK, Selby P, Perren TJ, et al. Detection of colorectal cancer cells in peripheral blood by reverse-transcriptase polymerase chain reaction for cytokeratin 20. Int J Cancer 1998:79;288-93. 65. Gunn J, McCall JL, Yun K, et al. Detection of micrometastases in colorectal cancer patients by K19 and K20 reverse-transcription polymerase chain reaction. Lab Invest 1996:75;611-6. 66. Soeth E, Röder C, Juhl H, et al. The detection of disseminated tumor cells in bone marrow from colorectal-cancer patients by a cytokeratin-20-specific nested reverse-transcriptase-polymerase-chain reaction is related to the stage of disease. Int J Cancer 1996:69;278-82. 67. Nakamura T, Yasumura T, Hayashi K, et al. Immunocytochemical detection of circulating esophageal carcinoma cells by immunomagnetic separation. Anticancer Res 2000:20;4739-44. 68. Mori M, Mimori K, Ueo H, et al. Clinical significance of molecular detection of carcinoma cells in lymph nodes and peripheral blood by reverse transcription-polymerase chain reaction in patients with gastrointestinal or breast carcinomas. J Clin Oncol 1998:16;128-32. 69. Miyazono F, Natsugoe S, Takao S, et al. Surgical maneuvers enhance molecular detection of circulating tumor cells during gastric cancer surgery. Ann Surg 2001:233;189-94. 70. Z'graggen K, Centeno BA, Fernandez-del Castillo C, et al. Biological implications of tumor cells in blood and bone marrow of pancreatic cancer patients. Surgery 2001:129;537-46. 71. Hardingham JE, Kotasek D, Sage RE, et al. Detection of circulating tumor cells in colorectal cancer by immunobead-PCR is a sensitive prognostic marker for relapse of disease. Mol Med 1995:1;789-94. 72. Funaki NO, Tanaka J, Imamura M. Quantitative analysis of alpha-fetoprotein mRNA in circulating peripheral blood of patients with hepatocellular and alpha-fetoprotein-producing gastric carcinomas. Life Sci 1998:62;1973-84. 73. Uchikura K, Takao S, Nakajo A, et al. Intraoperative molecular detection of circulating tumor cells by reverse transcription-polymerase chain reaction in patients with biliary-pancreatic cancer is associated with hematogenous metastasis. Ann Surg Oncol 2002:9;364-70. 74. Koike M, Hibi K, Kasai Y, et al. Molecular detection of circulating esophageal squamous cell cancer cells in the peripheral blood. Clin Cancer Res 2002:8;2879-82. 75. Piva MG, Navaglia F, Basso D, et al. CEA mRNA identification in peripheral blood is feasible for colorectal, but not for gastric or pancreatic cancer staging. Oncology 2000:59;323-8. 76. Yeh KH, Chen YC, Yeh SH, et al. Detection of circulating cancer cells by nested reverse transcription-polymerase chain reaction of cytokeratin-19 (K19) - Possible clinical significance in advanced gastric cancer. Anticancer Res 1998:18;1283-6. 77. Bessa X, Elizalde JI, Boix L, et al. Lack of prognostic influence of circulating tumor cells in peripheral blood of patients with colorectal cancer. Gastroenterology 2001:120;1084-92. 6 Endoscopic ultrasound-guided techniques for diagnosing pancreatic mass lesions: Can we do better?